President Trump's disinvite of the Philadelphia Eagles to the White House prompted a war of words. Now questions remain regarding who actually attended the "Celebration of America" at the White House. 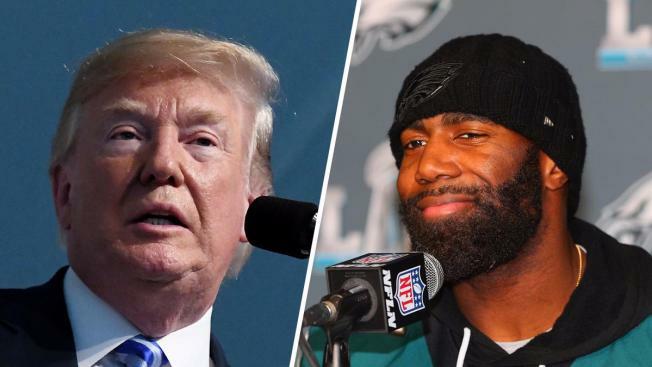 Using President Donald Trump's preferred communication method, Eagles star safety and political activist Malcolm Jenkins vowed via Twitter to continue fighting for "the truth" despite White House snub. On Tuesday, less than 24 hours after Trump disinvited the Super Bowl champions to D.C., Jenkins accused the White House of lying to "paint the picture that these players are anti-American, anti-flag and anti-military." "It's hard to step out in the public and fight to make it better," Jenkins tweeted. "It takes courage to stand up for the truth even if it's not a popular one." Jenkins' tweeted minutes after the White House issued its own statement doubling down on Trump's decision and accusing the Super Bowl champions of abandoning their fans by offering to send only a small delegation to D.C. The White House said it was the team’s “lack of good faith” that prompted Trump to cancel the celebration. “Unfortunately, the Eagles offered to send only a tiny handful of representatives, while making clear that the great majority of players would not attend the event, despite planning to be in D.C. today," White House Press Secretary Sarah Huckabee Sanders said in the statement. "In other words, the vast majority of the Eagles team decided to abandon their fans." Trump initially claimed his decision was rooted in the ongoing debate over whether NFL players must stand for the national anthem. That question became increasingly controversial after San Francisco 49ers quarterback Colin Kaepernick began silently kneeling on the sidelines at the beginning of games. Kaepernick's protest was intended to raise awareness around racism and, specifically, the killing of black men by police. But his on-field activism sparked criticism from both the NFL and football fans who claimed that politics and sports shouldn't mix. Things started to fall apart for the Eagles Friday when the Eagles reneged on their initial promise to send a group of 81 people to the White House, Sanders said. However, the Eagles asked to reschedule their visit because only a small handful of players could attend. The president, instead, canceled the celebration on Monday less than 24 hours before festivities were set to take place. Trump's surprising decision was announced late Monday evening in a short statement painting the team — whose mascot is also the United States' national symbol — as unpatriotic. In lieu of a visit with the team, the White House staged a “Celebration of America” featuring music provided by U.S. military bands and choruses. Hundreds of Eagles fans were expected to attend, but NBC10 reporter Tim Furlong counted only one Philadelphia jersey in the crowd. Perhaps anticipating yet another showdown as the 2018 NBA finals near, Cleveland Cavaliers star LeBron James said Trump's Eagles backlash is "typical" of this president. "I know no matter who wins this series ... it won't be Golden State or Cleveland going" to the White House, he said. "Let's not let someone uninviting you to their house take away from that [championship] moment." Meanwhile, a spokesman for the Villanova men's basketball team, which won the 2018 NCAA championship, told NBC10 they have not received an invitation from Trump to visit the White House. "Beyond that, we aren’t going to speculate on what the decision would be if one is forthcoming," Mike Sheridan said. “I'm very proud of our team. I'm very proud of the Eagles organization for their involvement in the community,” he said. "I'm really glad that the president disinvited them as opposed to some people going and some people not going because, this way, that doesn't leak into the locker room next season and there's not any disunity. They're a team together. They're the underdogs forever. And I'm proud of all of them." Kenney then doubled down on his feelings about Trump by urging Philadelphia to sign a petition for "Kenney's fight against Trump." The mayor even included a video of an eagle scaring Trump at his desk.